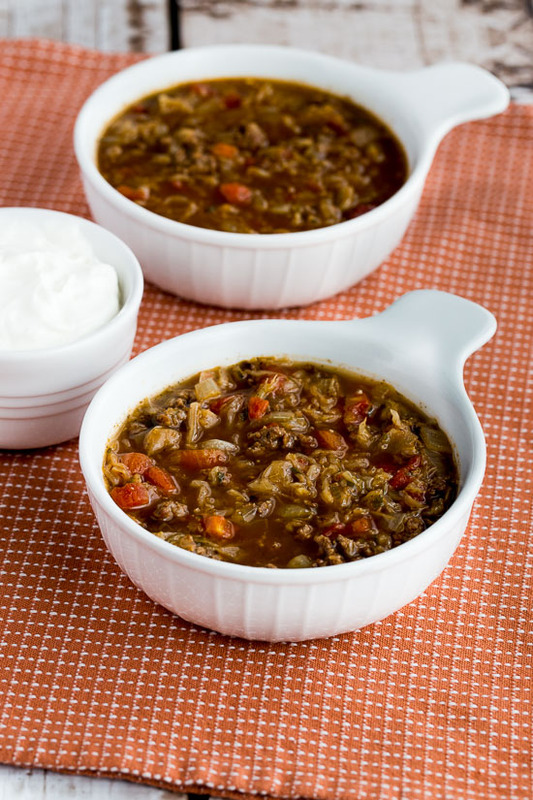 Ground Beef and Sauerkraut Low-Carb Soup is also Keto, low-glycemic, South Beach Diet approved and gluten-free, and it’s delicious! Use the Diet-Type Index to find more recipes like this one. 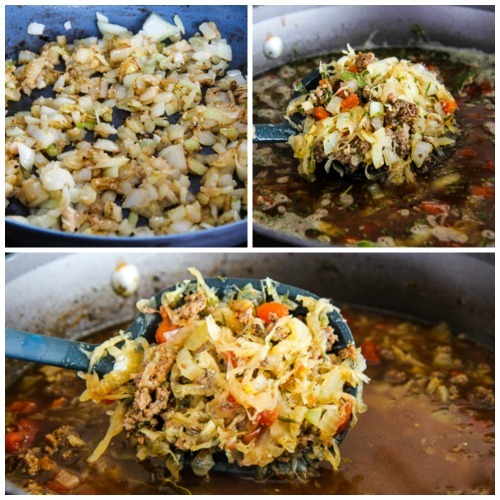 Click here to PIN Ground Beef and Sauerkraut Low-Carb Soup. Watch the video to see if you’d like to make Ground Beef and Sauerkraut Low-Carb Soup! 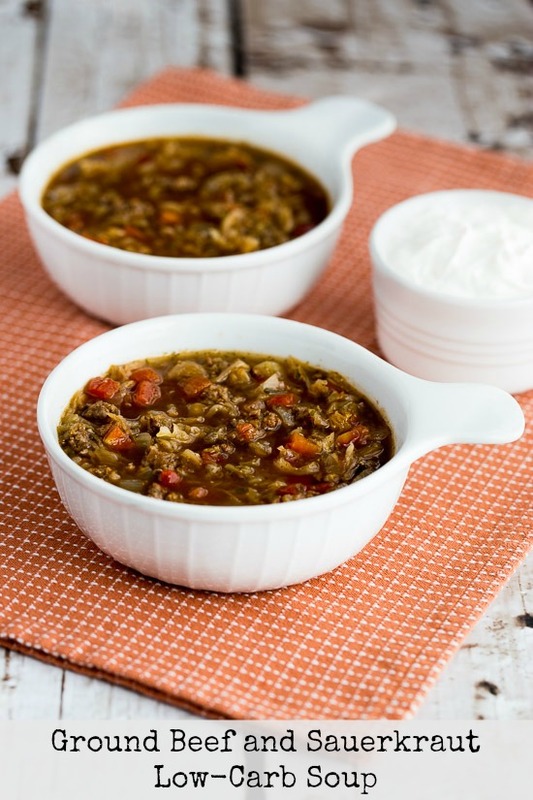 If anyone just rolled their eyes a bit at the mention of sauerkraut in this Ground Beef and Sauerkraut Low-Carb Soup, please stay with me a bit before you dismiss this recipe. There are a few good reasons to give this soup a chance! First, fermented foods are so healthy which is why they’re suddenly trendy, so the sauerkraut in the soup is a very good thing. Second, this soup is super low in carbs, easy to make, and freezes well. Third (and most important for people who are skeptical about the sauerkraut!) simmering sauerkraut in soup makes it sweet and breaks it apart into the soup, so that when you’re eating the finished soup you might not even realize it contains sauerkraut. Add a squeeze of sour cream, and this soup is absolutely delicious! A few years ago a faithful reader told me that she makes this soup every time she does Phase One and my friend Bonnie’s husband George adores it too. I’ve also made it quite a few times for my annual soup party, and people love it every year. And I make it myself every January, which is why I’ve updated the photos a couple of times! Start by cooking the ground beef until it’s well-browned. Don’t rush this, because browning adds flavor. While the beef is browning, start simmering the stock, canned tomatoes, sauerkraut, sweetener of your choice, Worcestershire sauce, bay leaves, parsley, and sage. When the beef is well-browned, add it to the soup pot and let the soup continue to simmer. Season to taste with a generous amount of fresh-ground black pepper (and a little salt if desired) and serve hot, with or without sour cream. 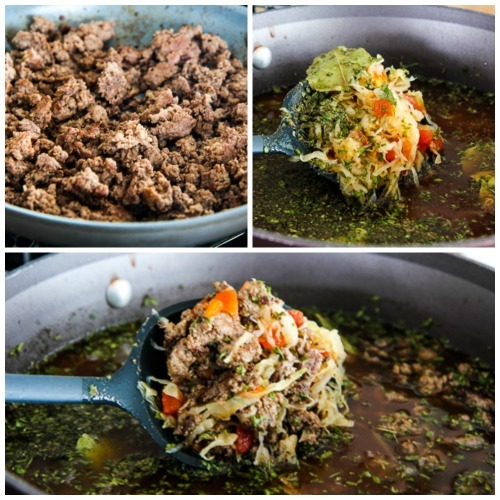 Ground Beef and Sauerkraut Low-Carb Soup is also Keto, low-glycemic, South Beach Diet approved and gluten-free, and it’s delicious! In heavy frying pan, heat 1 tsp. olive oil, add ground beef and brown well, breaking into small pieces with turner. This will take as much as ten minutes but don’t rush the browning step. While ground beef browns, combine chicken stock, beef stock, canned tomatoes, sauerkraut, granulated Stevia or sweetener of your choice, Worcestershire sauce, bay leaves, parsley and sage in large stock pot. Bring to a low simmer. When beef is well browned, add to soup in pot. Deglaze pan with a bit of the soup liquid, scraping off any browned bits, and add to soup. Wipe out frying pan and add other 1-2 tsp. olive oil. Saute onions 2-3 minutes, until starting to soften, then add garlic and saute 1-2 minutes more. Add to soup, reduce heat under soup pot and let soup simmer at low heat about one hour. After an hour, taste for seasoning and add water if soup seems too strong. Simmer 15 minutes more if adding water. Season to taste with fresh-ground black pepper (and a little salt if desired) before serving. Serve hot, with sour cream if desired. I know I was inspired by a recipe I saw somewhere, but I can’t remember where I saw it! This looks really tasty! I’m curious what kind of onion I should use though, yellow/white/red? Thanks for sharing, can’t wait to try this at home! I wouldn’t use red onion but either white or yellow will be fine. This soup was fabulous! I had purchased sauerkraut specifically for this recipe and bought a larger 28 oz can so I decided to put the entire can in the soup. I also had in the pantry a 28 oz can of Italian spiced diced tomatoes and also put the entire can in the soup. I was in a rush and didn't saute the onions and garlic, just put it directly in. This turned out fabulous! I had enough to freeze for a quick weeknight dinner. This soup is really delicious. My boyfriend loved it too and was happy to hear it was a SB friendly recipe. I am making it tonight for the second time. I used Muir Glen fire roasted tomatoes. I think the little bit of smokiness balanced well with the kraut. Thank you for this recipe! And it was so easy to make! Katie, so glad you guys enjoyed it. Those tomatoes would be perfect for this! This soup was so easy to make and it is so delicious and wonderful for the month of January in the Upper Peninsula of Michigan. I was so happy to find this recipe since we can our own sauerkraut and I have many pints of sauerkraut in my cellar. I now have one more recipe for it. Thanks Kalyn! Katherine, so glad you are enjoying it. This is a new one for me, it looks really good. Thanks Amy; hope you enjoy! Just wondering…Has anyone tried this recipe using vegetarian soy crumbles in place of the beef or turkey? I don't eat meat, but this sounds like a great soup – I love sauerkraut. Karen, I haven't use that kind of product but if it normally works as a substitute for ground beef I bet it would work just fine in this recipe! Love to hear what you think if you try it! I made the vegetarian version this morning. YUM! I posted a couple of pictures under the recipe on your FaceBook page. So glad that worked Karen, will go check out your photos! I had a pound of leftover ground beef and half of a large can of sauerkraut left over from other recipes. So I did a search and found your recipe. Perfect! Thank you; I enjoyed it tremendously. Beth, great idea! I bet I would like that. Just made this to use up some pickled cauliflower that was too strong for me to want to eat it straight. It may not be exactly the same recipe, but it tastes really good! I didn't know you could cook with the packets; thanks for sharing that! Katie, so glad you guys have been enjoying the recipes! I'm making this one for dinner tonight. My bf and I have nearly finished week 1 of Phase 1 and I was really desperate for some beef mince! It's simmering away at the moment (my bf is not impressed that he has to wait about an hour before he can eat it haha!) and smells delightful. Thankyou for all your SBD information and recipes, you've definitely made it easier at mealtimes! Monica, glad you liked it, and your version sounds yummy! I made this in the crock pot! I changed a few things. I used ground turkey, and all beef broth, and doubled the sauerkraut. I browned the turkey, and didn't bother cooking the onions first. I put all ingredients in the crockpot except the sauerkraut and let it cook on low for about 8 hours, then threw in the sauerkraut and let it cook for about an hour. It was super yummy! My boyfriend loved it too! I can't wait for leftovers tomorrow! Thanks for the great recipe! I cannot get over how good this sounds. I wish my husband liked kraut! Glad to hear people are liking the soup. I heard from someone who added rice too, for a phase two version. We made this recipe for supper last night and wow! – it will definitely be going into our Favorites file! Thanks for sharing, Kalyn! Kalyn, I loved this soup. The tang of the sauerkraut was very palate pleasing, and the overall flavor was just terrific. I just posted a variation of your soup on my blog, including a link back to your blog for credit. Thank you for posting such amazing recipes. YUM! Linda, as you can see, there are a lot of people who did like the soup. Maybe sauerkraut just isn't your thing. Sorry it didn't work for you. I'm sorry to say this wasn't a favorite of mine. And I'm a big fan of homemade soups and of sauerkraut. Not sure what it was about this soup, but I just dumped it in the sink. Keep 'em coming, though, I've loved every other recipe of yours that I've tried Kalyn! Susan, I bet it's just as good with ground turkey. Glad you liked it. Carole, thanks for sharing the article, very interesting. I love anything with cabbage, so that's a no-brainer for me. Some of the others I never eat though. Eileen, so happy to hear it was a hit with you and the 3 year old both! This was really tasty! I've never had sauerkraut in anything and this soup was delicious. My 3 yo liked it. Kalyn, you never steer me wrong! This soup is currently simmering for our dinner tonight and the house smells lovely. I am a huge fan of "anything cabbage" so I like to try any new recipes I see with this wonderful gift from the gods. Not sure if you have seen this article that I am referencing, but thought you would love to know that you are doing everything right with your wonderful ingredients. Thanks again for a great recipe idea. Delicious — flavorful and filling. I also used ground turkey, and the taste and texture was great. Thanks very much. I made this tonight, too. It looked great, it smelled delicious, and best of all, it tasted like the cabbage rolls from my favorite Polish restaurant back home. I decided to make it on the spur of the moment, and had to make a few substitutions to avoid running to the store (ground turkey instead of beef, broth made from bouillon cubes, stevia instead of Splenda). But it still turned out terrific.